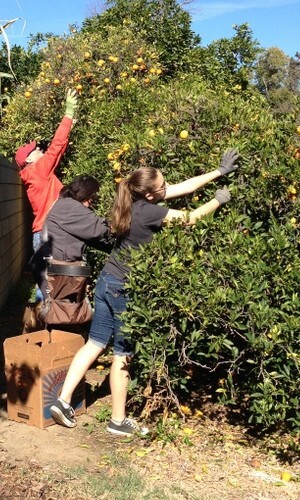 The Fruit For All Family reunited to pick an old friend’s Valencia orange tree this morning. Co-founder Zach Selby is back from college this summer and his brother Jackson is spending the summer here before heading to college. We gathered as a family this morning for a “reunion” pick, plus some help from three Food Forward friends. It’s great to have both boys back on the ladders. And, our host is a return customer. We’ve been picking her tree since 2011. Grapefruit trees can be deceiving; they hide their treasures among the leaves. 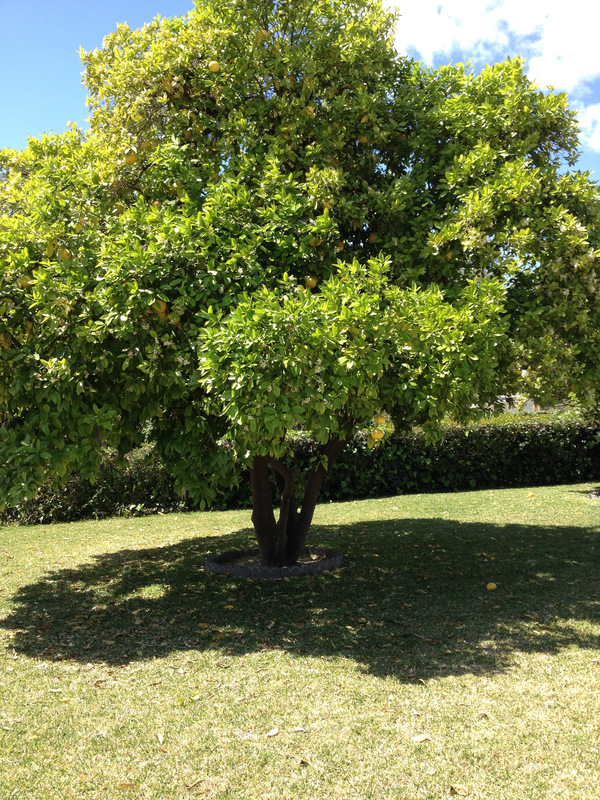 In the past 5 years, this grapefruit tree in Monrovia has yielded 4,500 pounds of fruit. Fruit For All started picking the tree in 2010, and we have picked there every year since. This year, Food Forward volunteers harvested more than 800 pounds. It took 6 of us about an hour. What a bountiful tree. Thanks to the homeowner for inviting us back each year. Angelina and James teamed up to reach the fruit at the top of the tree. 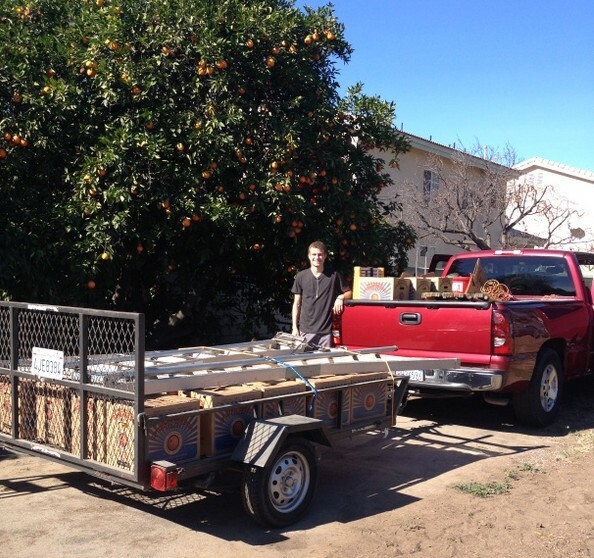 Jackson takes a breather after loading up this 1,000-pound load of fruit. Food Forward volunteers returned to the home of an old friend for the fourth time, celebrating Martin Luther King Day. A dozen volunteers met to harvest more than 1,000 pounds of grapefruit, tangerines and oranges. Thanks, Old Friend, for welcoming us back. Many of our trees are immediately happier after we’ve been there to pick their fruit. 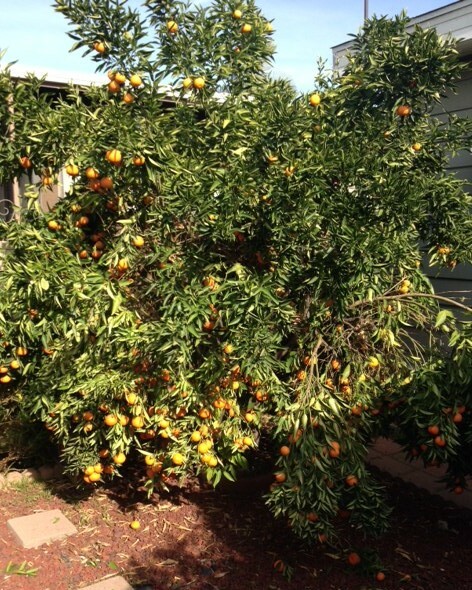 This small tangerine tree in Monrovia, CA, was hanging low with all of its fruit, but the branches pop up immediately as we pick. It’s a happy tree. Before: The branches droop under the weight of the fruit. After: The tree is relieved to have its burden picked. We had a wonderfully successful pick this past weekend at a Fruit For All veteran homeowner. This was the fourth time we have picked her grapefruit trees and the first time as a Food Forward representative! 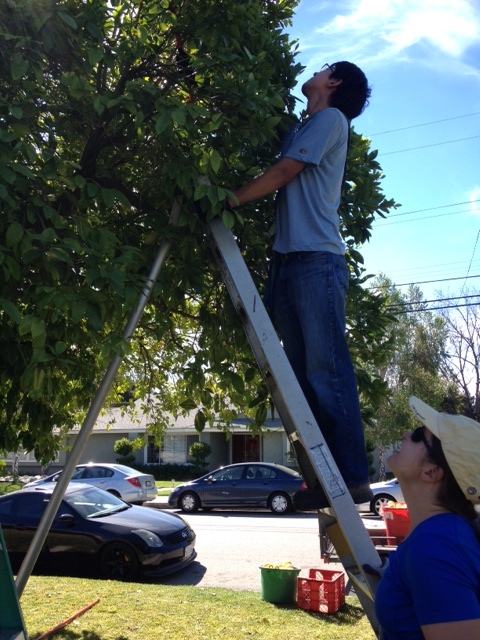 Homeowners rely on us, and we rely on them to help us provide good, fresh fruit for folks who need it. Thanks Mrs. Grapefruit Owner! On Sunday, October 27th, Fruit For All and Food Forward volunteers picked a persimmon tree in Monrovia for the third year in a row. 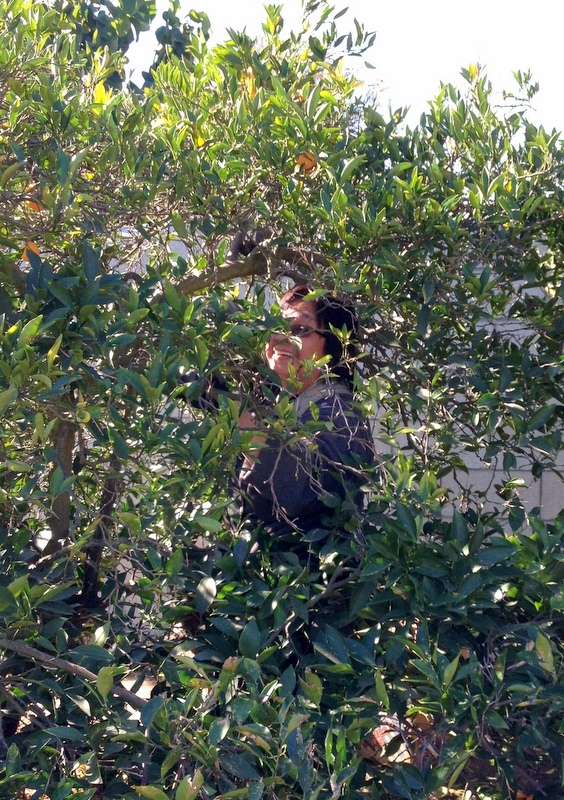 Fortunately, the homeowner contacted us before the persimmons were too soft to handle. We harvested more than 300 pounds. Thanks to the volunteers that helped out and the homeowner for calling us again. Sam’s Club in El Monte provided Fruit For All with much needed banana boxes to put harvested fruit in from February 2011 to September 2012. Without them we would be have had a hard time finding alternatives. 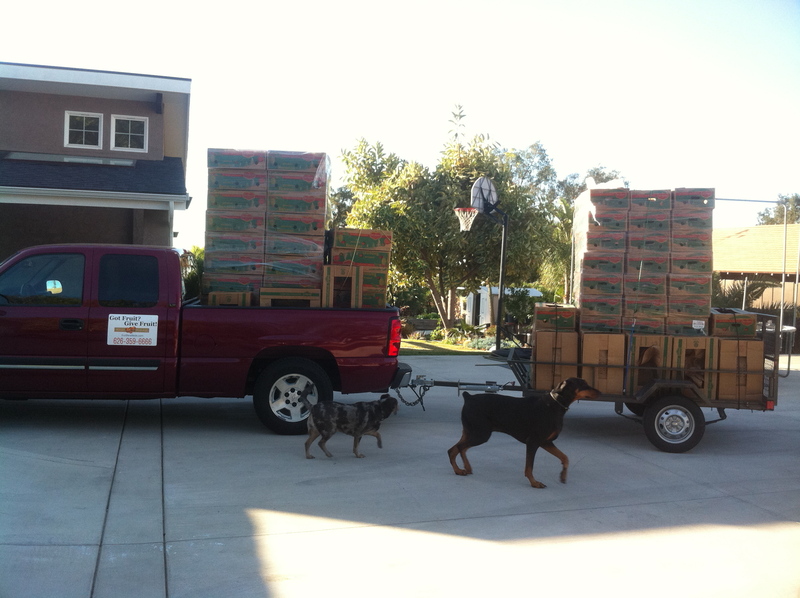 On February 4, 2012, they really out did themselves by giving us more than 130 banana boxes in one trip. One of our 2011 clients connected us with Sam’s Club and we have been forever grateful to them and the guys in produce.